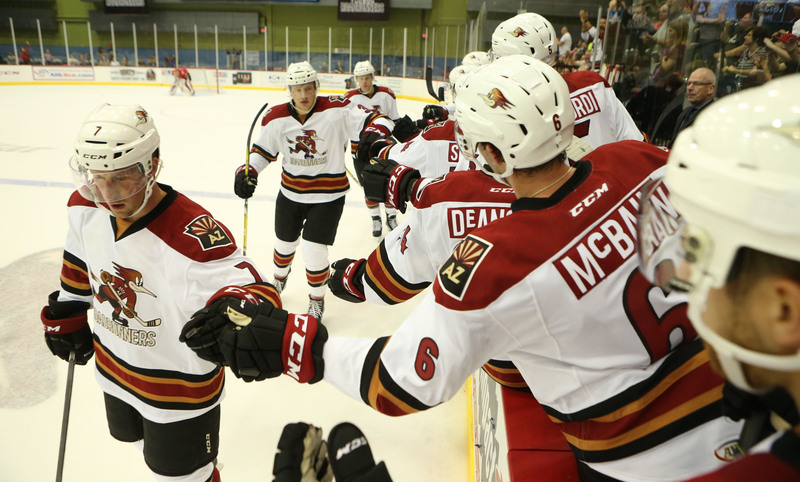 The Roadrunners regrouped after a dicey start Friday night to beat the Stockton Heat 6-5 in the club's home opener at Tucson Arena in front of an announced sellout crowd of 6,251. The early stages of the game, however, were rather difficult. “Stockton came out hard, I don’t think we came out completely ready, myself included,” said Adin Hill of the Roadrunners’ rather lethargic opening minutes of the contest. Stockton momentarily subdued the energy that was built during the pregame ceremonies when they tallied three goals in the first 5:11 minutes of the affair, forcing Head Coach Mark Lamb to call a timeout to resuscitate a frazzled Roadrunners roster. Jarred Tinordi started Tucson’s comeback effort midway through the first when his wrist shot from the right point found its way through traffic, beating Stockton’s Jon Gillies to record the team’s first-ever goal on home ice. Just over two minutes later, Mark Olver followed suit when he beat Gillies high on a two-on-one rush to get the Roadrunners to within a goal. In the second, the Heat regained a two-goal lead when Morgan Klimchuk beat Adin Hill. 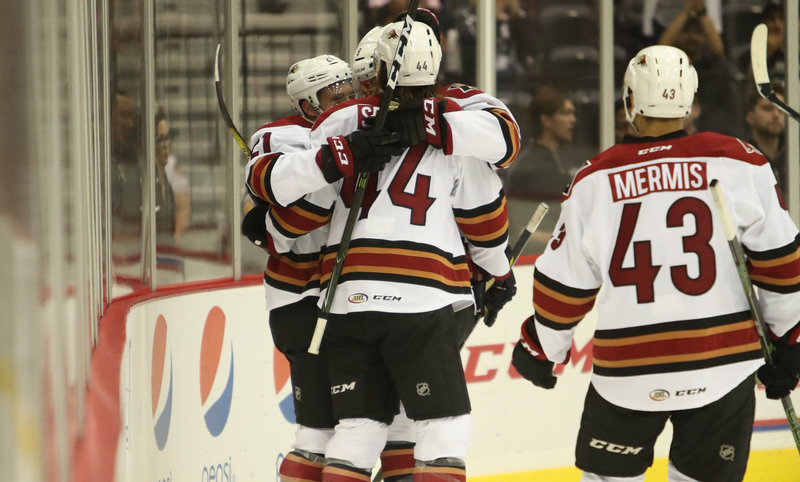 The Roadrunners answered to tie the game 4-4 with two goals in a 1:32 minute span, the first coming off the stick of Ryan MacInnis, who drove to the net with a hard move to the left after teaming up with Conor Garland on a quick give-and-go sequence. Tyler Gaudet finished a two-on-one rush when Christian Fischer caused a turnover in Tucson’s zone, recovered the puck, and drove up the ice shorthanded to deliver a gorgeous back-door pass to Gaudet, who jammed the puck past Gillies. Early in the third, the Roadrunners took their first lead of the evening when Chris Mueller wristed home a Jamie McBain pass from the high-slot. Stockton tied the game 5-5 with 9:57 to play in regulation. With just over three minutes left in the third, and fresh out of the penalty box from serving a roughing infraction, Eric Selleck received a stretch pass from Tyler Gaudet, walked in alone on Jon Gillies, and beat the Heat’s goaltender with a shot low through the five-hole to give the Roadrunners a 6-5 lead, the night’s eventual final score. The win was Tucson’s third straight; they are the only team to beat Stockton this season. The Heat came into the night atop the Pacific Division. Tyler Gaudet (1G, 2A) and Anthony DeAngelo (3A) led all Roadrunners players in points scored (3). The Roadrunners are scheduled for an 11:00 AM practice Saturday at Tucson Arena; they’ll play the Stockton Heat Sunday evening at 4:05 PM MST.